To create a Measurement Error Model for estimating the population of cities requires multiple indicators to compute available estimates that are common to all urban areas. Using these various factors will allow us to create a working model that includes variable estimates that are unique for each city and specific standard estimates that remain constant in the model. This is one of the most common estimates to be found on cities throughout history. Cities throughout the Afroeurasian Region have commonly used walls to surround and protect the city and its inhabitants from invasions and environmental disasters with many cities having concentric rings of walls built over time. It is also one of the easiest and most distinctive remnants of a city that can be identified by archaeologists. This is a much harder estimate to account for since this includes the urban area outside the walls of the city. This area is usually a poorer or industrial section of the city where the inhabitants of the city either cannot afford to live within the current city walls or are not wanted within the walls due to pollution or noise. This includes only the residential buildings in the urban area and the total space they take up. This does not include the roads or other un-utilized living space around the residential housing such as open squares or water wells. This is another common estimate that can be found in archaeological work done on cities based on the distinctive residue a domestic hearth leaves behind in soil. This can also be sometimes found in historical records taken for census or tax purposes as in the case of the 1691 Hearth Tax in Edinburgh. The number of houses in the urban area makes up the total residential area and is usually found as estimates in historical documents or is calculated by archaeologists and demographers from the number of domestic hearths in the city. The Non-Residential Area includes all religious and military buildings that make up the city as well as the total area that is taken up by roads, sewers, baths, and other space not specifically used for residential space including vacant spaces. 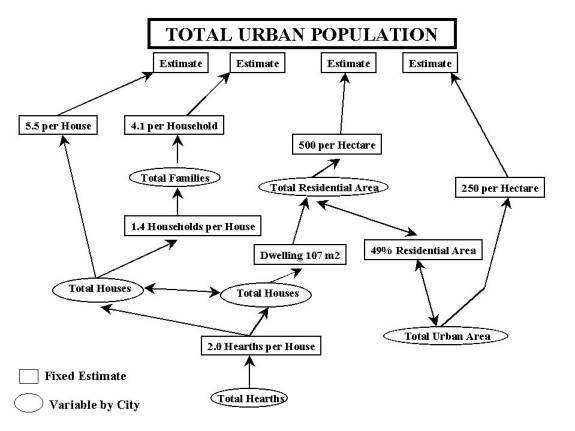 The number of families in a city provides a counter estimate to the total number of homes in an urban area and was commonly used in early censuses done in cities. This number is an estimated standard from Alston (2002) who calculated an average of 5.40 – 5.52 people per house. Others, like Dingwall (1994) and Adamson (1981), use an average of 4.5 per house while Galley uses an average of 6.1. This average is estimated to be 1.4 families per house in urban areas from Alston (2002). This is supported by the 1.5 families per house when averaging the 1.96 families per dwelling from the 1801 census of London and the 1.07 families per dwelling for 1638 by Finlay (1981). The number is represented in a range from 3.9 to 4.1 people per family. An average of 4.1 people per family was reached from the 4.09 per family found in North London from the 1801 census. When multiplied by the 1.4 families per dwelling this reaches 5.74 people per house. The other end of the range is estimated by dividing the 5.5 people per house estimate by the 1.4 families per house to achieve an average of 3.9 people per family. While the range of variation appears very small, any change in the estimate affects the overall population estimate. In a comparison of the model of London for 1800, the estimate of 3.9 per family became an average total population estimate in the model while using the 4.1 became the high total population estimate. See Table 1. Using the 3.9 per family constant creates only a four-percent variance in population estimates while using 4.1 for the constant creates a seven-percent variance in population estimates for the model. The Average Size of Dwellings is computed by two measures. First the average total floor area of the dwelling and then divided by the average number of stories per dwelling. The average total floor area was estimated using the standard dwelling sizes of several cities, calculated by Alston in Table 2, to compute an average dwelling size for all cities of 214 meters squared per house. The average number of stories per house is estimated at two from Alston (2002)  and Hobson (1985). This then creates an average of 107 meters squared, 214 meters squared of total floor area divided by an average of two stories, when calculating the total residential area in an urban area from the number of houses in the urban area. This estimate has been derived using the estimates generated from London in 1650, 1681, and 1700 where the total residential area consistently accounted for 49 percent of the total urban area. This matches estimates by others including Bagnall (1993) who used an estimate of 50 percent residential when looking at Hermopolis. This is one of the most common estimates used to estimate city sizes and has varied greatly depending on who is doing the research. The estimate reached for the model was computed by taking the average density from several population estimates to the total urban area of London in Table 2 to reach an average of 214 per hectare and rounded up to 250 for the model. An average of 500 persons per hectare for the residential area is estimated. This was calculated from the results of the 1801 census and the 1639 census of London, which found an average of 490.41 and 498.46 people per hectare within the walled area respectively. This also matches the total of doubling the average per hectare for the total area (Since the total residential area accounts for 49 percent of the total area). This then creates a total of 14 individual factors for our measurement error model to use when estimating the population of a city. Seven of the factors are fixed estimates that remain constant in the model and are used in conjunction with the other seven variable estimates that are unique for the specific city being used in the model. The model then is divided into four groups while allowing variables to cross between the groups to fill in for any missing information. The use of four groups of variables allows for a range of four estimates to be calculated and therefore not rely on a set estimate for the population. Bagnall, Roger S. 1992 Egypt in Late Antiquity. Princeton University Press. Bairoch, Paul; Batou, Jean and Chevre, Pierre 1988 La Population des Villes Europeennes de 800 a 1850. Geneva: Librairie Droz. Carter, Harold and Lewis, Roy C. 1990 An Urban Geography of England and Wales in the Nineteenth Century. Edward Arnold. Chase-Dunn, Christopher 1985a "The system of world cities: AD 800-1975" Pp. 269-292 in Michael Timberlake (ed.) Urbanization in the World Economy New York: Academic Press. Chase-Dunn, Christopher 1992 "The role of cities in the transformation of world-systems" Volker Bornschier and Peter Lengyel (eds.) World Society Studies, Volume 2. Frankfurt and New York: Campus Verlag. Dingwall, Helen M. 1994 Late Seventeenth-century Edinburgh. Scolar Press. Fetter, Bruce 1990 Demography from Scanty Evidence: Central Africa in the Colonial Era. Boulder and London: Lynne Rienner Publishers. Finlay, Roger 1981. Population and Metropolis: The Demography of London 1580-1650. Fraser, P.M. 1972 Ptolemaic Alexandria. University Press, Oxford. Seventeenth Centuries. Liverpool University Press. Hobson, Deborah W. 1985 House and Household in Roman Egypt. Cambridge University Press. Alston (2002) p53 on House Sizes. Alston (2002) p59. According to Alston the number of stories varies between 1 and 4 in an urban area with some exceptional cases as high as 7 stories for one house in Alexandria. He considers about 40% of urban housing being two stories with the average house to be two stories. Hobson (1985) p217 Hobson is looking at houses in Karanis where she found three one-story houses, six two-story houses, and three three-story houses in a represenative sample to reach an average of two stories per house. Bagnall (1992) p53. While Bagnall uses an estimate of 50 percent for Hermopolis he uses this to determine an estimate of 115 houses per hectare and 87 meters squared. The 87 meters squared per house does not match the average household reached here using Alston (2002). Hermopolis does not support the use of 250 per hectare but this may be due to the questionable total area computed by Delia. This estimate came from the 1801 census and the total area within the walls form Finlay (1981) p168-171. This estimate came from totaling Appendix 3 for the total area within the walls and from the total population in 1631 in Appendix 4. Finlay (1981) p168-173.